The Inn is known to be haunted by the dog of a Lincolnshire countryman named William Clarke, who was hung for murdering a gamekeeper. It is said that the dog can be seen walking around the Castle walls looking for his owner, and can sometimes be heard scratching at the door of the pub. There have been reports that when the dog is ignored, it can be heard barking at the door waiting to be let in. Many of the locals have claimed to have seen the figure of a dog sat by the bar and others have sensed a dog brush past them but on looking down, nothing is ever there. Once Clarke had been executed, the landlord of the Strugglers Inn gave the Lurcher dog a home and looked after it until it died. The owner was so inconsolable that he decided to get the dog stuffed and displayed it in the bar. The stuffed animal now resides in the Castle museum. The Strugglers Inn is in Westgate in the Bailgate area of Lincoln. It is famous for its location adjacent to the Castle. At the time when hangings were carried out as a punishment, people often gathered in the pub to watch the event take place on the Castle tower. The pub dates back to 1841 and it was originally called the Stuggler Beer shop. 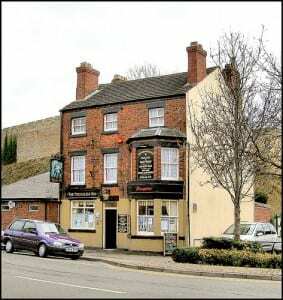 It has an image of a man struggling whilst being led to the gallows on the pub sign.It was once run by Albert Pierrepoint, a well-known hangman in Lincoln at the time. William Clarke’s gravestone still stands today within the Castles’ ominous walls. This year the pub has won the ‘Kamra Lincoln branch pub of the year’ competition and specialises in selling real ale.